Wedged between Estonia and Lithuania, Latvia is one of the three Baltic Nations, nestled in the northeast corner of mainland Europe. Since ancient times, Latvia has been a well-known trading post, earning recognition from empires as far as Rome and Greece for cultivating amber, which was then more valuable than gold. As a result, Latvia has long been a melting-pot of nationalities, attracting foreign visitors and workers from around Europe. Additionally, gaining independence from the Soviet Union in 1991, it then flourished economically, while leaving behind separate geographical regions, all with different social attitudes and cultural disparities, making Latvia even more exciting to explore today. A trip to Latvia means getting close to nature; it has the fifth highest proportion of land covered by forest in the European Union, almost thirteen thousand rivers, four national parks and over thirty thousand species of wildlife and plants. Unsurprisingly, then, it’s popular for cycling and hiking holidays, and the relatively short coastline has some gems for beaches, with the best silver stretches of sand to be found outside the capital, Riga, and by the resort town of Jurmala. 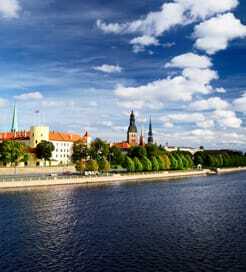 Latvia’s shining light, however, is the capital city. Set upon the Daugava River, close to the Baltic Sea, the cosmopolitan Riga oozes art nouveau, with facades decorated with intricate carvings of mythological creatures and a picturesque skyline primarily of Gothic spires. Famous for its UNESCO World Heritage Site listed Old Town, the city itself has been shaped by over eight hundred years of history, all while boasting modern art centres, trendy bars and innovative restaurants. Riga is also widely acknowledged as the birthplace of the Christmas tree, with some accounts dated back to the 1500s, meaning the city becomes even more striking during the festive season. Ferries traverse the Baltic Sea to a few ports on the Latvian coast, including the capital and a couple of port towns further west. With regular ferry routes from a couple of destinations in Sweden, it’s easy to reach Latvia from the Scandinavian Peninsula, while the slightly less frequent crossings from northeast Germany make it accessible from mainland Europe. For more information, please visit our Ferries from Germany to Latvia page.